Happy Anniversary Disney California Adventure® Park! Can you believe it’s been 15 years of fun? If you’re like us, you’ve oohed and ahhed on Soarin’ Over California. You’ve screamed your head off on California Screamin’, lost your stomach on The Twilight Zone Tower of Terror™ and made a splash on Grizzly River Run. And that’s just to name a few of the attractions we love. Over those 15 years, the original California story evolved to highlight Walt Disney’s storytelling heritage from the moment he stepped off the train in Hollywood with “a suitcase and a dream” to the beloved stories we all know today. Recently, we got to travel down memory lane with Kevin Rafferty, Executive Creative Director of Walt Disney Imagineering to get the backstory on how the Park continues to evolve. And sometimes in telling the story of California, an even bigger idea is born. 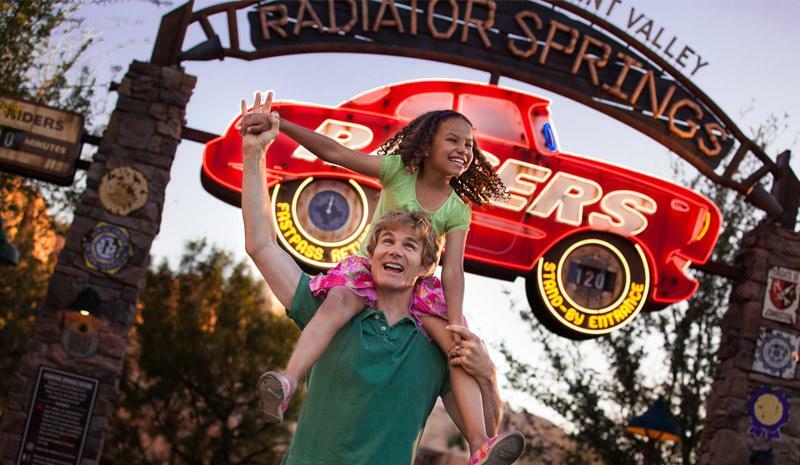 Rafferty recalls walking down Radiator Springs in Cars Land shortly after it opened, and overhearing an awestruck young boy ask his mother, “Mom, is this where they made the movie?” “I knew at that moment we had been very, very successful,” he says. Now a new personality has joined the fun with Luigi’s Rollickin’ Roadsters. “We wanted to bring more of the Characters from the Cars films to Cars Land,” Rafferty explains. But who would it be? There are so many great pals after all. Eyes quickly turned to fun-loving, eager, enthusiastic, emotive Luigi. But what would the story be behind the attraction? This is Disney, remember. Everything has a story. Disney California Adventure® Park is also home to the Disney Character Meet ‘N’ Greet at our private Disney Visa® Cardmember location.1,2So between your trips down Route 66 at Cars Land or The Little Mermaid ~ Ariel’s Undersea Adventure, make sure you stop by to see some of your favorite Disney Characters.